This double-layer Ventile® fully waterproof version of our Talorc Hybrid Jacket is perfect for winter walking, bushcraft, nature watching and skiing. Featuring an athletic fit, this stylish jacket features a distinctive Pictish inspired goose logo. On a practical level, there is a host of zipped pockets for safely storing away your essentials, including an inner mobile phone pocket with wire access for ear-phones. 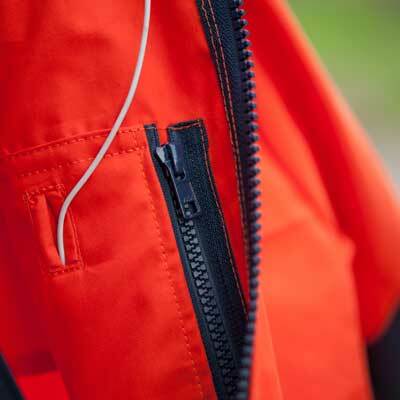 An adjustable hem and hood allow for temperature control in a variety of conditions. For even more heat control and comfort, add optional underarm pit-zips. For a lighter weight version of the Talorc optimised for less arduous conditions, take a look at our Talorc Hybrid Ventile Jacket. The Talorc Ventile® Jacket is inspired by our Pictish forefathers who were tough and uncompromising and yet created unique and beautiful art. It is named after a Pictish King said to originate from the North East of Scotland. Fits great and the design, from pocket placement to cuffs and hood, is very functional. Tested it cycling in some damp and cold weather as soon as I got it. Worth every penny. Dave and his team did a fantastic job on my jacket. I got some customizations too it and I love it. I love and know that this jacket will last me a life time.